Former President Barack Obama warned Democrats against sitting out the midterm elections during a North Philadelphia rally Friday for U.S. Sen. Bob Casey, Gov. Wolf, and the party’s other candidates in Pennsylvania. He singled out young, African American, and Latino voters amid concern that the traditional drop in turnout from presidential years could harm the Democratic Party’s chances of gaining ground in Congress and statehouses amid low approval ratings for President Trump. And he chided Trump, without naming him, for bragging about improving economic conditions that started before the Republican moved into the White House last year. “So when you hear right now, folks, right now, taking credit for this economic miracle, c’mon, they act like it all just started. 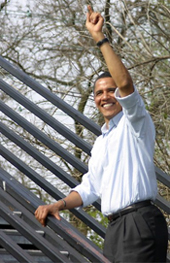 Please,” Obama told a raucous crowd of about 5,000 at the Dell Music Center…. ← Receiving a letter like this makes our day!